This recording is available for noncommercial and educational use only. All rights belong to the authors. 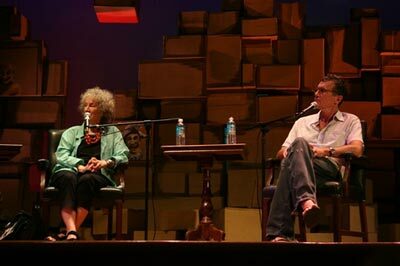 © 2003 Margaret Atwood and Michael Cunningham. Used with permission from Margaret Atwood and Michael Cunningham. I am a South African author and playwrite. I also teach creative writing, at present at the Breyten Breytenbach Centre in Wellington (South Africa). I am interested to refer to this interview in a lecture. Hi Rachelle, please feel free to refer to this as you see fit, just cite its origin in “the audio archives of the Key West Literary Seminar” and, if possible, offer a link to its location here. Thank you for sharing.